Glucosamine, chondroitin, ginger extract with antioxidants formula in Glucogin may help maintain healthy joints, muscles and bones. 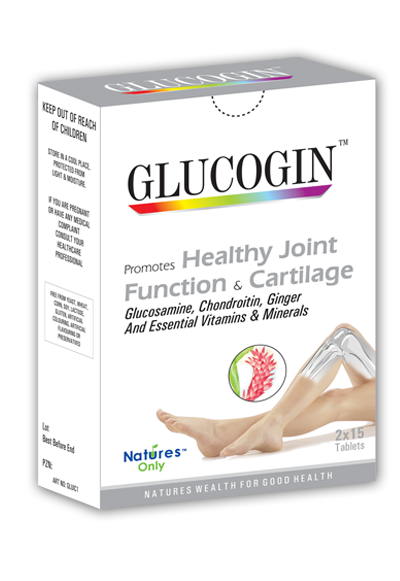 Glucosamine lays down the foundation for the everyday rebuilding of the connective tissues in the joints, including tendons, ligaments and cartilage. Chondroitin is present in cartilage and connective tissues and is involved in the attraction of fluid that lubricates the joints. Ginger supports the health of sore joint and has a pain relieving soothing action on joint and muscles. Selenium, zinc, manganese, vitamin D, vitamin E along with ginger are integral constituents of the antioxidant formula and are essential for building and maintaining strong healthy bones.